Pinkadots Elementary : "What do I do now????" "What do I do now????" Does this sound familiar? Besides my answer, which 99% of the time is to go back and check your answers, add more description, or check your spelling (depending on the assignment) it is usually read your just right book. For my students who do an awesome job the first time and crave something other than reading, I created this writing menu of choice. I used our school poster maker and enlarged it so the kids can see it from where ever they sit. When students finish their assignment and I check off on their work, they know they have the option of reading or taking out their writing journal and picking a topic. This alleviates me from hearing the dreaded and repeated..."What do I do now!???" The ideas I included in the menu are fun for anyone and the same choice can be written multiple times with different ideas. I find it important to leave a few minutes at the end of the class every other day or so for students to share their work. 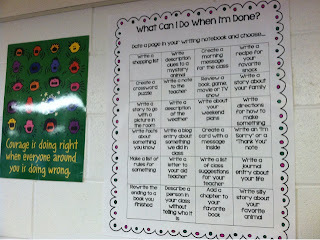 This allows the students to hear what other classmates have written and give feedback to one another. Not only do the students enjoy this idea, but on my recent principal observation, the principal was very impressed with the students leading themselves to completing more work without wasting any time, after their assigned assignment was complete. It has helped with their writing stamina and I've notice whatever writing strategies we are working on in class, appear in their writing journals. I couldn't be happier to see my students making the connection on their own. If this sounds like something you'd like for your classroom, I just added it to my TPT store for FREE! Just please, please, please, leave me feedback and let me know how you use it and how your students like it! So jealous of your poster maker!! !